Parkway celebrate their PFA Sunday Cup Final success. Photo: David Lowndes. Parkway won the PFA Sunday Senior Cup for the second season in a row at Chestnut Avenue last night (April 6). And for the second successive year they were victorious in a penalty shoot-out. Their victims last night were AFC Stanground who lost in the same fashion as Bretton North had in 2015. Stanground's Finnegan Brookes misses the final penalty in the PFA Sunday Cup Final shoot-out. Photo: David Lowndes. The shoot-out score was 4-3 with Josh Staggs and Finnegan Brookes nervously slamming Stanground’s third and fifth penalties over the crossbar which is was in complete contrast to the classy dinked spot-kick converted by team-mate Dan Fountain - a brave effort as a miss then would have handed the trophy to Parkway. Danny Steward also missed the target for Parkway. A strong wind ruined an even contest between two Peterborough Sunday Morning Division One sides. Staggs supplied an excellent finish to fire Stanground ahead after 19 minutes before Juliano Menezes equalised 10 minutes before half-time. Menezes was set up for an easy finish by a typically strong dribble into the area by Jamie Graham. Chances were rare after the break with Stanground ‘keeper Lea Jordan twice saving well from Graham, but not as well as Parkway’s Ben Derbyshire saved to thwart Liam Merryweather’s point-blank header. Derbyshire was named man-of-the match. 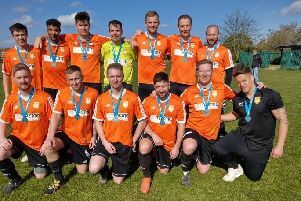 Parkway could yet celebrate a club double as their reserves will start as warm favourites to beat Moorhen Reserves in the final of the PFA Sunday Junior Cup at the same venue tomorrow (April 8, 7.30pm). March Town United were also celebrating last night after pipping Wisbech St Mary 1-0 in the final of the North Cambs Junior Cup Final in dramatic fashion. The game was dead-locked and heading for extra time when central defender Max Matless powered home a header from a corner to avenge a defeat at the hands of the same team in last year’s final. Also last night Oakham United Reserves moved to within five points of the top of Peterborough League Division Two with a hard-fought 2-1 win over third-placed Spalding Town. Oakham have five games in hand on long-time leaders Glinton & Northborough. Holbeach United will move upto fourth in the United Counties Premier Division with a win at relegated Huntingdon tonight (April 7). (7.30pm): Moorhen Reserves v Parkway Reserves (Chestnut Avenue).